Business owners have complained that they haven’t been given enough information about Papal disruption. A Pope Francis cardboard cutout on Wicklow St in Dublin. 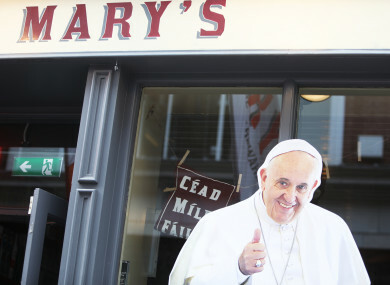 BUSINESSES IN DUBLIN are said to be “nervous” ahead of the weekend’s papal visit and have complained about the “uncertainty” surrounding footfall in the capital. Pope Francis will be moving through the city on Saturday and Sunday and widespread road closures are being put in place. The plan includes creating a broad ‘Controlled Access Zone‘ which will encompass a significant portion of the city, extending from the quays to Ballymount, on the south side, and to Finglas, on the north side. A total of 52 different road closures will be in place between the hours of 6am and 7pm on Saturday and even more closures are planned for Sunday, when 86 roads will be closed. Yesterday, further plans were revealed for the Pope to travel through the centre of the city, allowing crowds to see him on the way to the Festival of Families in Croke Park. Garda Assistant Commissioner Pat Leahy said that “anything up to 100,000 people” could line the streets to view the Pope as he goes by. The scale of the disruption has left locals confused about plans for the weekend and businesses are also complaining that they have not been given enough guidance about what to do. Spokesperson for the Dublin Chamber of Commerce Graeme McQueen said yesterday evening that there is a great deal of concern among restaurants and retailers about the plans. “Businesses in the city are nervous about this weekend. There’s a lot of confusion out there about what’s going to happen. Many fear that the city centre is going to be extremely quiet, with people seemingly having resigned themselves to the fact that it is going to be extremely difficult to get around Dublin,” McQueen says. This is generally due to a lack of information and poor communication on behalf of the organisers. The information that’s been put out has generally came late in the day and been very confusing. It was known a long time ago that the Pope’s visit is happening, yet, here we are just a few days before the event, and there is a huge amount of confusion around road closures and public transport plans and what will and won’t be possible this weekend. Pope Francis’ cavalcade will travel up O’Connell Street, Westmoreland Street and Dame Street at around 4.15pm on Saturday afternoon and some businesses in the area have expressed confusion about what they should do. Monika Marcimkowska of jewellery store Pandora on Henry Street told TheJournal.ie that she was equally unsure about whether to close, but that after speaking to others in the area she felt it was best to open. “I was asking other shops on the street and they were all staying open, so I was thinking I’d stay open as well as I don’t want to lose any business. Like, it could be busy or it could be quiet so I thought I’d open and take a chance,” she says, adding that she does feel businesses could have been told more. I don’t think I have enough information to be honest, I just got a little leaflet in the post with the roadmap saying Henry Street will be closed, that’s it, nothing else. So I’m expecting the roads will be busy but I’m not sure if we’re going to be busy. Marcimkowska said that staff have been told to allow some extra time to travel to work but that aside from that they’ve made no other specific arrangements. Speaking also about the ease of movement around the city, McQueen says it may affect everyone. “Retailers and restaurateurs are unsure whether customers are able to reach them, and there’s also uncertainty as to whether staff will be able to make it to and from work,” he says. Email “'Businesses are nervous about this weekend. There’s a lot of confusion about what’s going to happen'”. Feedback on “'Businesses are nervous about this weekend. There’s a lot of confusion about what’s going to happen'”.